Sarah Bond has written on the issue of the fetishization of whiteness in the history of art with respect to ancient sculpture. Her discussion centers on the influential work of Johann Joachim Winckelmann and his monumental Geschichte der Kunst des Alterthums (1764). Museums and expensive art books were one way Winckelmann’s theories were popularized in the 18th and 19th centuries, at least in Europe, where there were large, “encyclopedic” museums developing (the British Museum, the Louvre, etc) with increasing numbers of marble sculptures. In the US, however, museums were not prevalent in the 19th or early 20th centuries and were still limited to places like Boston and New York. And yet, it is in the United States that this fetishization of classical whiteness seems to have become especially prevalent in popular culture. The question I want to examine here is how. 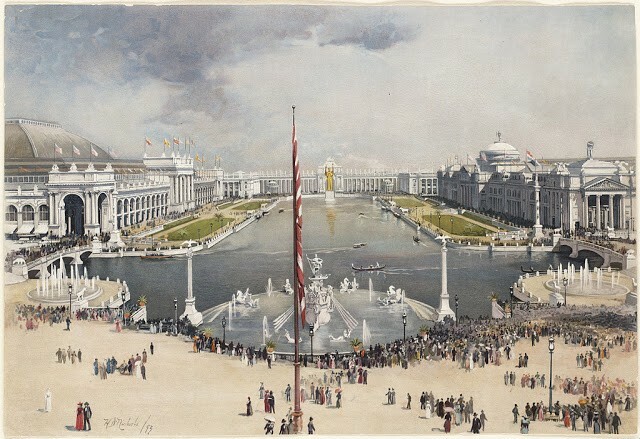 And my suggestion for an answer is that the 1893 Chicago World’s Fair, aka the Columbian Exposition, and the White City catapulted classical whiteness as ideal into the consciousness of Americans, and its impact has yet to fade. This is not a complete guide or exploration of the connections forged at this fair between Classics and white supremacy, but merely an attempt at a beginning. Recently my class discussed the Fair. That this fair (and those that followed), the forerunners of Disney Parks and Coney Island, were designed to popularize white supremacy came as a bit of a shock to them. It is probably a bit of a shock to many people. But the creators of the fairs — the masters of industry, the banks, the federal and state governments, university academics and museum officials — didn’t hide this fact. 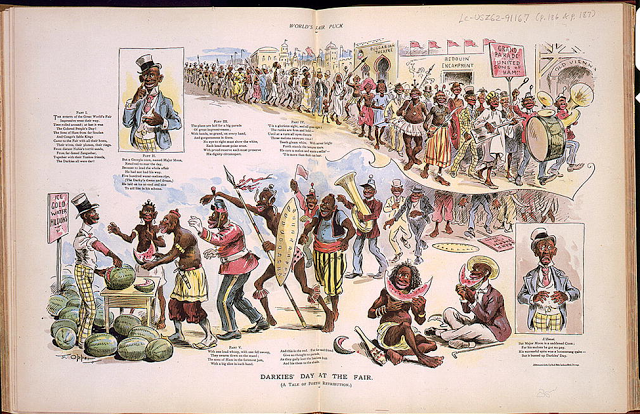 Documents written by the designers of the fair were open that the fair was for white Americans to see their place at the top of a racial hierarchy, and for non-whites to remember their subordinate place (there are some awesome anecdotes about this — ask me sometime). “a little ideal world, a realization of Utopia…[foreshadowing] some far away time when the earth should be as pure, as beautiful, and as joyous as the White City itself” (Chicago Tribune Nov. 1, 1893 quoted in Rydell 1984. All the World’s a Fair. U of Chicago Press). The construction and appearance of the White City was a homage to the Classical past in form, content, and ideology. 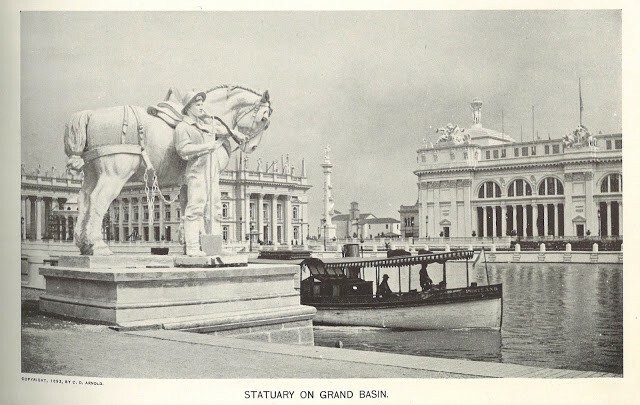 The decision to build the White City along a stretch of marshy land along the shore of Lake Michigan reflected a confidence in the engineering and technology of the builders — Vitruvius himself would have been done proud by the feat. The designs for the building were neo-Classical and, although not marble (they weren’t intended to be permanent), they were faced with plaster and painted white to reflect the whiteness of Parian marble. Of course, how white were the buildings of Athens that coloration of the White City was intended to reflect? Pretty white (except for all the color!) — the Expo buildings lacked the painted friezes and other elements of their inspirations in Athens. More importantly, though, were the sculptures everywhere throughout the White City. It’s one thing to surround oneself with white building, quite another to do so with monumentally sized white sculptures intended to reflect ideal beauty. Each of the sculptures was commissioned for the Fair and showed clear Classical referencing. 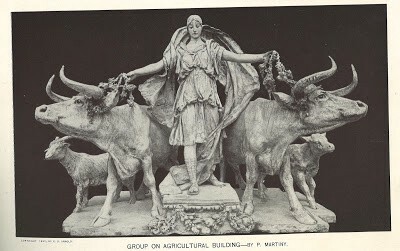 Even those sculptures that were not allegories or mythical (such as that of Agriculture right or the Statue of the Republic, also below) were intended to Classicize those they represented and elevate them to the level of the Classical past. Farmers, in particular, the “Average American” at whom the Fair’s morality lessons were directly aimed — the “plain, sturdy, self-reliant, ambitious man” appeared in Classically monumental form. 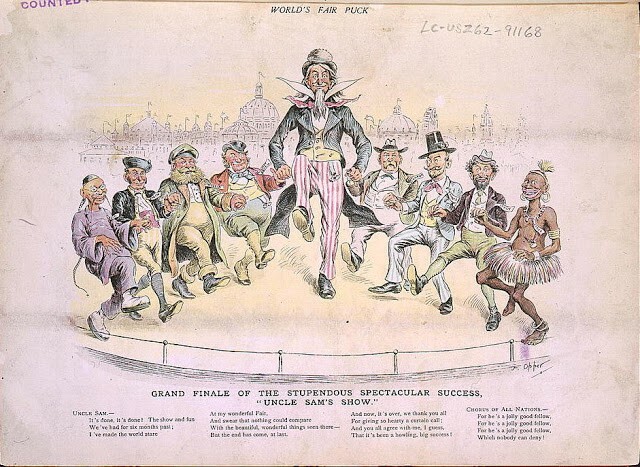 This White City and its idealized America was set in direct contrast to the Midway Plaisance where the different peoples of the world were put on display as entertainment and morality lessons. Just a few images demonstrate the contrast intended between the power, beauty, and technological advancement of “white” America and the darker skinned “savages” both within the US and without. 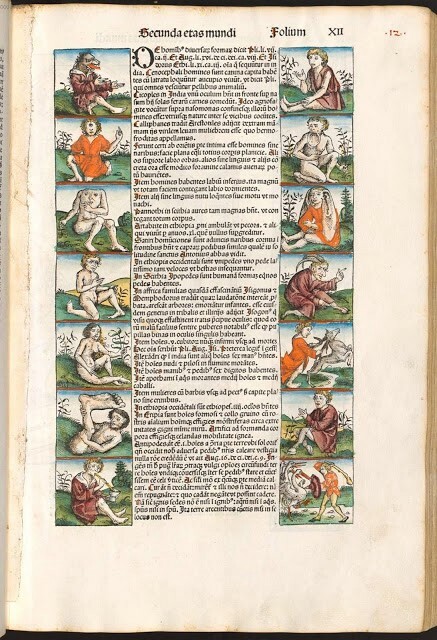 From the Nuremberg Chronicle.The parade of “types” of peoples was meant to entertain and resembled more Pliny’s peoples at the edges of the world than an accurate map of the world — stereotypes and exoticisms were emphasized in the name of entertainment. How much of the theory of the expo, and not just the visuals, was also an explicit attempt to harness the wisdom of the classical past to white supremacy? 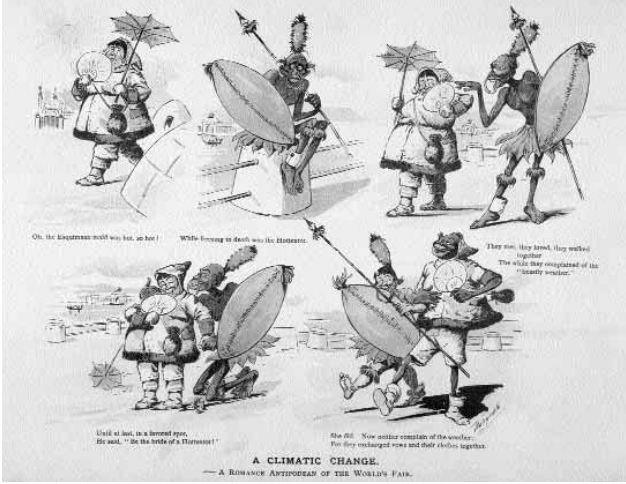 The Congress on evolution on the “Intellectual and Moral Exposition of the Progress of Mankind” gave academic and scientific weight to the representation of the non-white peoples on the Midway. The ancient theory of environmental determinism (most explicitly discussed in the Hippocratic Airs, Waters, Places and in Bk 6 of Vitruvius’ de Architectura) linked climate, geography, and topography to human cultural and physiological differences. Otis Mason was a strong proponent of the theory and linked it explicitly to technological advancement, particularly the ability of a culture to use technology to overcome limitations of environment. The thrust of his scholarship and his Smithsonian and World’s Fair displays underscored this link, heavily influenced by his Classical education (he was, in fact, a Classics teacher before turning to Native American studies). 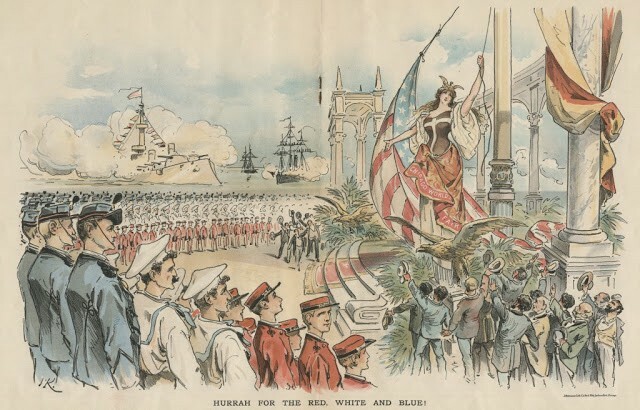 The combination of the Classical past in imagery and idea with the technological innovation and patriotism expressed in the fair had the aim of creating a unified white America and recruit them on a journey to a great white utopia — a utopia that “average” Americans could be a part of. 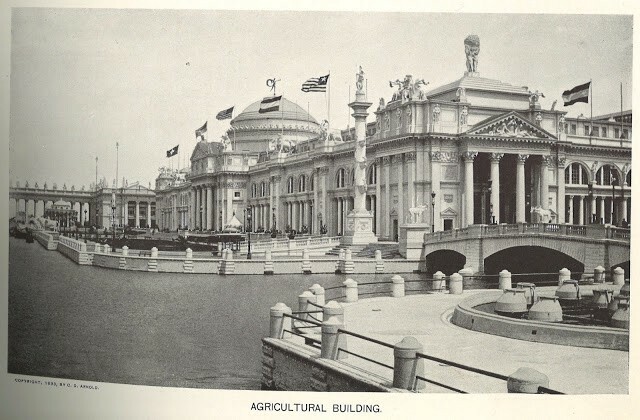 The impact of the fair’s Classical architecture was decades of architectural mimicry in cities throughout the country. The equation of Classical antiquity with America and with “civilization” was a lasting memory. “May we not hope that the lessons learned here, transmitted to the future, will be potent forces long after the multitudes which throng these aisles have all measured their span and faded away?” (Potter Palmer, 12 Oct. 1892, at the public dedication of the Fair). Palmer’s wish came true. 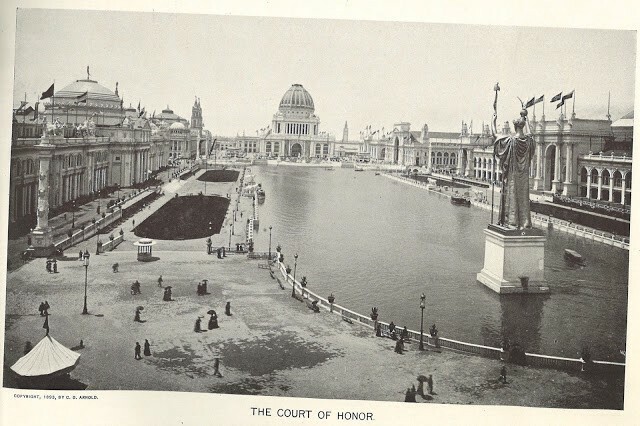 The 1893 Chicago World’s Fair forged an indelible bond between Classics and white supremacy that we are only now starting the shake loose over 100 years later. For a fuller picture of the extent of Classical imagery used in the Fair, see the Rand McNally & Co. Handbook of the World’s Columbian Exposition (1893), especially the sections describing the Midway, and the documentary Expo (narrated by Gene Wilder). For those interested in the extent to which ancient theories of environmental determinism permeated the Smithsonian, see Brill’s Companion to Classics and Early Anthropology, ed. by Emily Varto and scheduled for release in 2018. Among other relevant chapters in the volume, I have one on Mason and the relationship between his classical education and anthropological theories.